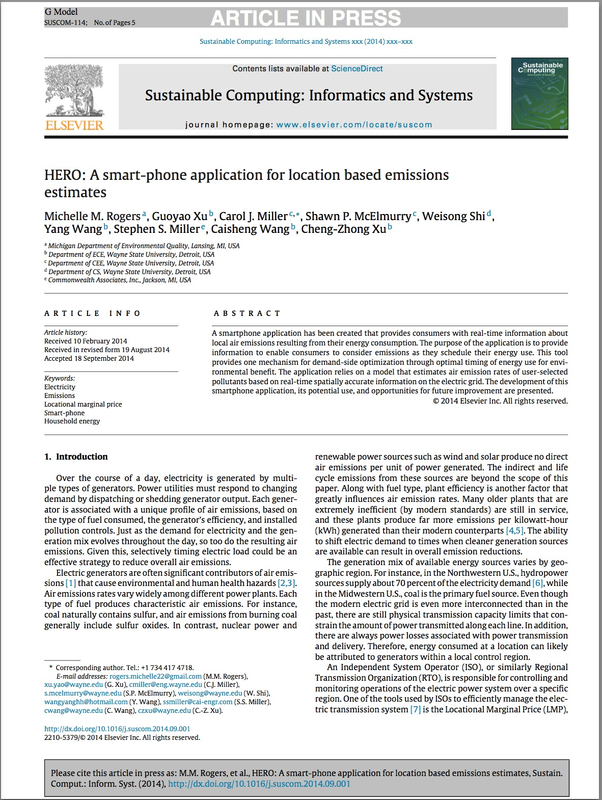 Rogers M., Miller, C.J., McElmurry, S.P., Xu G., Shi W., Wang Y., Wang C., Xu, CZ, "HERO: A smart-phone application for home emissions estimates," Sustainable Computing, Informatics and Systems, 2014, In Press. 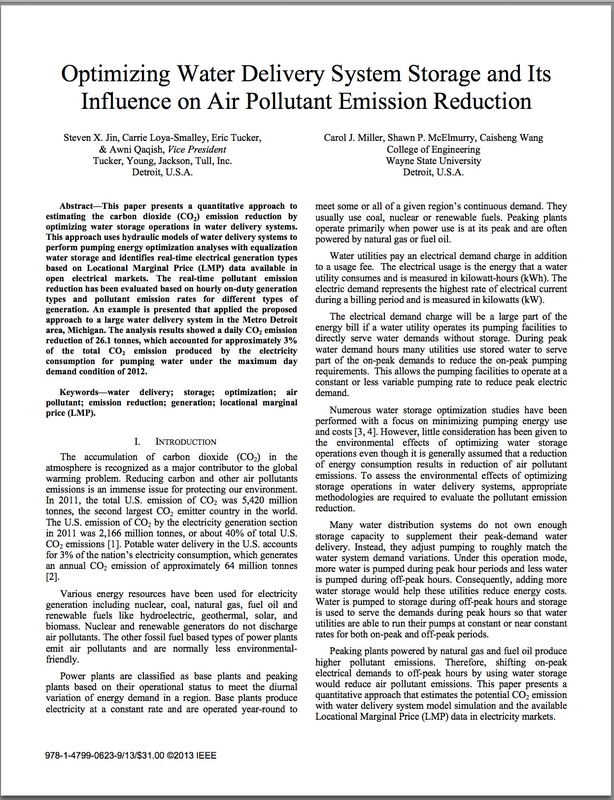 Jin, S., Loya-Smalley, C., Tucker, E., Qaqish, A., Miller, C., McElmurry, S., Wang, C. Optimizing Water Delivery System Storage and Its Influence on Air Pollutant Emission Reduction. 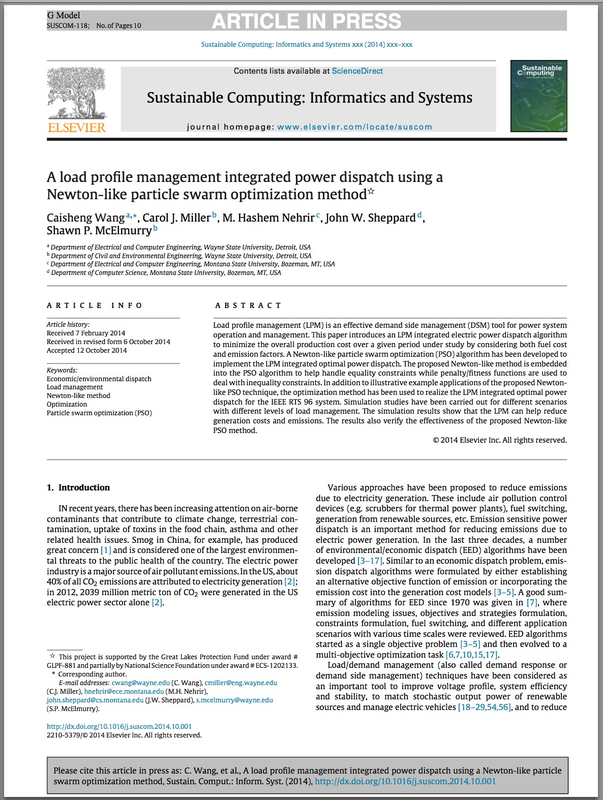 Wang, C., Miller, C.J., Nehrir, M. H., Sheppard, J.W., and McElmurry, S.P., "A Load Profile Management Integrated Power Dispatch Using a Newton-Like Particle Swarm Optimization Method," Sustainable Computing, Informatics and Systems, 2014, In Press. Rogers, M., Wang, Y, Wang, C, McElmurry, S.P, Miller, C.J. 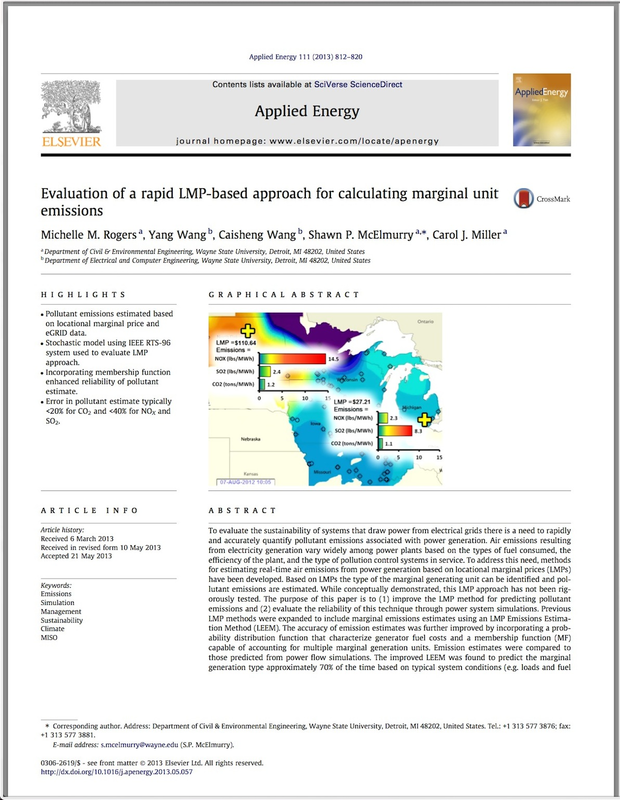 (2013) Evaluation of a Rapid LMP-Based Approach for Calculating Marginal Unit Emissions. 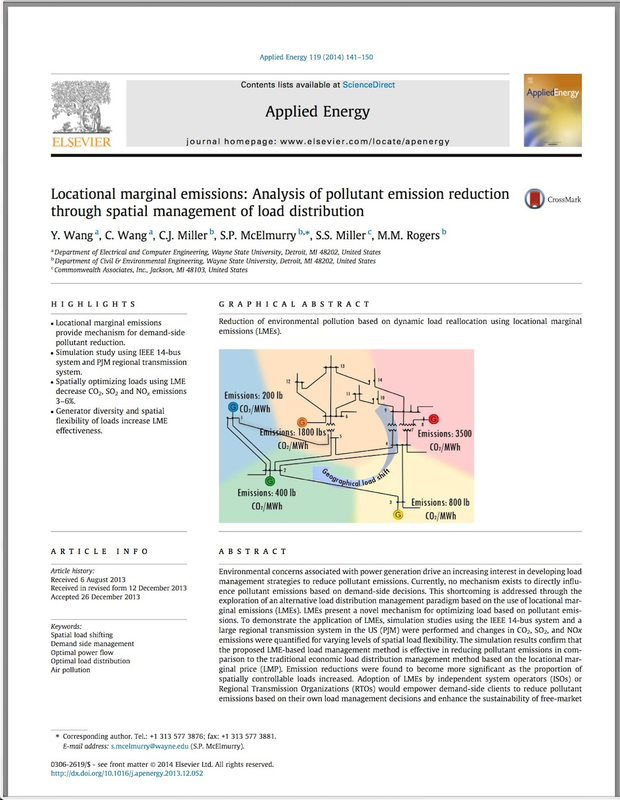 AppliedEnergy, 111, 812-820.doi:10.1016/j.apenergy.2013.05.057. Fatemeh Alighalehbabakhani,F., Abkenar,S., Jin,S., Miller,C., Fracasso,P., McElmurry,S.P. 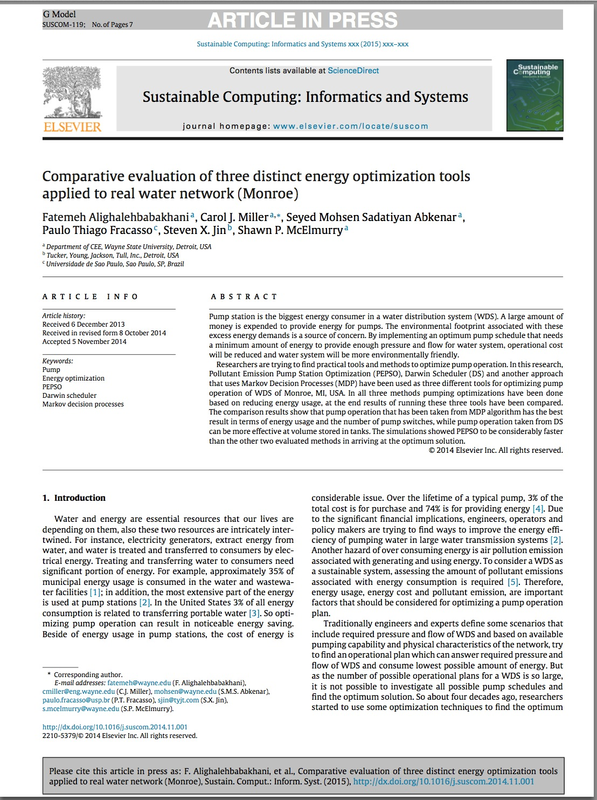 Comparative evaluation of three distinct energy optimization tools applied to real water network (Monroe). Michigan Dept. Envtl Quality GreenUp! Green Chemistry and Engineering Conference. Detroit, MI. 26 Oct 2012. IEEE Energy Tech Conference. Cleveland, Ohio. May 26, 2011. First International Congress on Sustainability Science & Engineering. Cincinnati, Ohio. August 12th, 2009.